"Melania Trump," Stephanie Grisham wrote, "is proud to be the first lady of the United States and is proud to represent the American people." The first lady's approval rating is at its lowest point since just before President Trump took office. Before she got to the meat of her argument, Melania Trump's spokeswoman conceded that she might be wasting keystrokes. The media, she conjectured, were doubtless going to take her CNN opinion piece as an "assault on the press" and continue to push the narrative that Melania Trump was a reluctant first lady. Stephanie Grisham - a staunch defender of Trump whom insiders have nicknamed "the enforcer" - wrote the op-ed in response to what she deemed a "trivial poll" about the first lady's dropping favorable rating among Americans and an ensuing piece by a network contributor that said Trump "doesn't understand what it means to be first lady." The argument that Trump does not want and is not good at her current job is, of course, not new - as anyone familiar with the #FreeMelania hashtag can attest to. 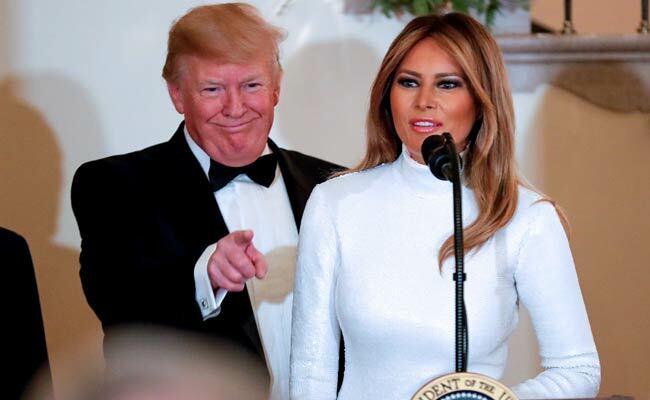 But Grisham argued that all the first-lady-like things that Trump has been doing are vastly underreported, including: reading Christmas stories to sick children, flying out to an aircraft carrier to visit members of the military for the holidays, hosting a successful state dinner and dozens of holiday events at the White House, and representing the administration at a state funeral to which her husband was not invited. "CNN has a dedicated reporter who covers Mrs. Trump," Grisham wrote. "But the media consistently ignores the first lady's work on behalf of the people of this country, and children in particular, in favor of more trivial matters." "Each event in her comprehensive 'Be Best' initiative is focused on helping children with the many issues they face today," Grisham continued. "Yet, somehow, she is still characterized as a "reluctant" first lady. And Kate Andersen Brower's take that Trump doesn't understand what it means to be first lady, Grisham wrote, was a "condescending opinion, apparently written in response to a single answer Mrs. Trump gave in a Fox News interview Wednesday,"
"The simple fact is that Mrs. Trump deserves honest reporting and media coverage that focuses on the substance of her message: the importance of helping children grow up to be happy, healthy and socially responsible adults," Grisham wrote. Grisham's op-ed was another show-of-force for the spokeswoman. Last month, she wrote the statement about the Trump administration's now-ousted deputy national security adviser, who was involved in a dust-up over the size of the first lady's entourage on the Africa trip in October, as The Washington Post reported. The bad blood resulted in a searing statement that Grisham issued to reporters about Mira Ricardel: "It is the position of the Office of the First Lady that she no longer deserves the honor of serving in this White House." A day later, White House press secretary Sarah Sanders announced Ricardel's departure - and Grisham's "enforcer" nickname was solidified. As Sarah Ellison wrote last week in The Post: "Grisham's role has drawn attention for her acerbic statements directed at those who have crossed Melania Trump and her husband. When Trump attacked Mika Brzezinski in the summer of 2017 and claimed falsely in a tweet that she was 'bleeding badly from a facelift,' rather than shying away from the controversy, Grisham offered this statement on Melania Trump's behalf: 'When her husband gets attacked, he will punch back 10 times harder.' When Donald Trump's first wife, Ivana Trump, cheekily called herself the 'first Trump wife' and therefore 'the first lady' while promoting a book last year, Grisham called Ivana 'attention-seeking and self-serving.' Grisham even got into an argument on Twitter with Issa Rae after the actress said in an interview that she would cancel her show 'Insecure' if she learned that Melania Trump was a fan." The first lady's approval rating is at its lowest point since just before President Trump took office. And people's opinion of Melania Trump also has been influenced by, well, Melania Trump. As Heil wrote, Melania Trump has recently "taken a higher-visibility role, traveling solo to Africa and speaking about her platform, Be Best." She drew criticism for wearing a safari helmet on that trip, which some said made her look like a colonialist tourist. In an interview with ABC News in October, the first lady called herself "one of the most bullied people in the world." She also has said that women accusing men of sexual assault needed to show "really hard evidence." During a June visit to the U.S.-Mexico border, where children were being separated from their migrant parents by the Trump administration, the first lady wore a jacket that read "I really don't care, do u?" She said the jacket's message was intended "for the left-wing media" and other critics. Many say it painted her as coldly aloof to the plight of Mexican and Central American immigrants. In a statement, Grisham later said that "there was no hidden message." In the end, Grisham said, the whole op-ed exercise might be for naught. "I could continue with examples, but will inevitably be attacked for having a 'woe-is-me attitude' - it couldn't possibly be that we are defending ourselves," she said. "Regardless," she added later, "Melania Trump is proud to be the first lady of the United States and is proud to represent the American people."